Search for the best flight prices from Manchester to Isle of Man. Compare prices, book today and save money with Manchester Airport. (or Ellan Vannin, to use the local lingo) and you might think TT – the annual no-holds-barred motorcycle race on the island’s public roads. But dig deeper to find traditional hospitality (and a few ultra-modern tax exiles) right in the middle of the Irish Sea. Its location (equidistant from England, Scotland and Ireland) give its influences a unique flavour... in cuisine, mythology, culture and more. 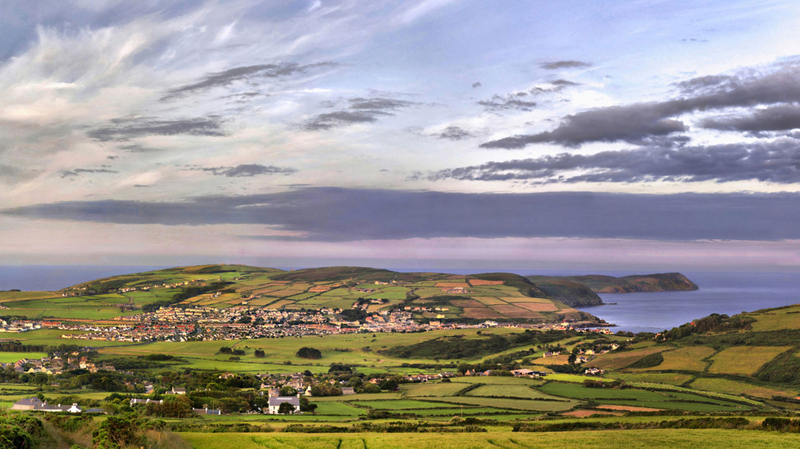 From leisurely historic stays to quaint B&Bs with sea views, the Isle of Man has a lovely assortment of accommodation. For a room with a view, gaze at Castle Rushen from The George Hotel (The Parade) in Castletown or out to sea from The Edelweiss guest house (29 Palace Terrace, Queens Promenade) in Douglas. Overlooking Douglas’ bay and the beach is the modern and comfortable Ellan Vannin Hotel (31 Loch Promenade). Alternatively in the island’s capital, settle down in stylish surrounds at the Acacia Boutique Hotel (Marathon Terrace, Queens Promenade) – ask for one of the individually designed suites that feature sumptuous seven-foot beds. Popular souvenirs from the Isle of Man include Manx tartan, woollen jumpers and kippers. Find high-street shopping aplenty in Douglas; the capital city has a liberal supply of familiar retail names, as well as souvenir shops for local specialities and gifts – The Strand Shopping Centre (Strand Street), in particular, is a good place to stock up. For interesting boutique shopping and local crafts, head to Ramsey in the north of the island and the narrow streets of the island’s ancient capital Castletown in the south. Farmers markets regularly pop up in Douglas, Castletown, Ramsey and Tynwald Mills. Local culinary specialities include Manx kippers, bonnag (a sweet bread) and the traditional island dish of ‘spuds and herrin’ (boiled potatoes and herring), while seafood and game dishes are very popular. Housed in a 19th-century timber merchant’s house in Douglas, 14 North (14 North Quay) has a menu packed with fresh flavours, such as fresh crab with lime, coriander and chilli. Nearby family-run seafood specialist Tanroagan (9 Ridgeway Street) serves refined takes on well-loved classics, such as an Isle of Man crab toastie and smoked salmon Scotch egg, as well as full-on fish feasts like local lobster. Experience the island’s green landscape and calm coastline by foot, and learn about its Celtic and Viking heritage with a varied programme of guided walks. This festival also includes Manx dancing and traditional music events. The national day of the Isle of Man sees parliament held in the open air at Tynwald Hill in St John's, offering the public the opportunity to present lawmakers with their petitions. This event is accompanied by a parade, music and festivities, and has been celebrated since the mid-15th century. Held at the Villa Marina Gardens in Douglas, this festival is an enthusiastic celebration of the island’s growing food and drink industry, featuring a bounty of home-grown produce. Tuck into a delectable feast made from ingredients produced on the island. Running from the Point of Ayre in the north to the Calf Sound in the south, this 75km route takes riders through the island’s fresh forests, moorland paths, country lanes, and flat, speed-inducing roads. This adrenaline-fuelled, three-day event is one of Europe’s main rallying events, attracting international drivers to its fast-paced course.